What is a Pension and How Do You Get One? A pension is a type of retirement plan that provides monthly income in retirement. Not all employers offer pensions. Government organizations usually offer a pension, and some large companies offer them. With a pension plan, the employer contributes money to the pension plan while you are working. The money will be paid to you, usually as a monthly check in retirement, after you reach a specific retirement age. A formula determines how much pension income you will receive once you are retired. For example, a pension plan might offer a monthly retirement benefit that replaces 50% of your compensation (as measured by taking an average of your pay over your last three years of service) if you retire at age 55 and have at least ten years of service. With that same pension, if you work longer and retire at age 65 and have thirty years of service, the pension might provide a retirement benefit that replaces 85% of your compensation. More years usually means more money. Pension plans must follow specific rules set out by the Department of Labor. These rules specify how much the company must put away each year into an investment fund in order to be able to provide you a defined pension amount in the future. Most pension benefits are taxable. When you begin taking pension income, you'll need to determine if you should have taxes withheld from your pension payment. If after-tax money was contributed to the pension, a portion may be tax-free. Sometimes with pensions paid due to disability, a portion of the benefit may be tax-free. These tax-free situations, however, are limited. It is best that you plan on paying taxes on any pension income you will receive. Can a Pension Plan Be Terminated? If your employer offers a pension, they can decide to terminate it. In such a situation your accrued benefit usually becomes frozen; meaning you will get whatever you've earned up to that point, but you cannot accumulate any additional pension income. In some cases, pension plans were managed poorly and were not able to pay out all of the promised benefits. 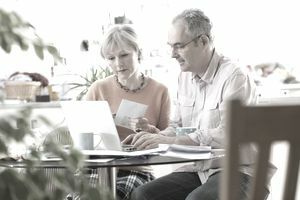 If the pension plan was a member of the Pension Benefit Guaranty Corporation (PBGC) then in this circumstance, some benefits are protected for pension plan participants. What If My Employer Doesn’t Offer a Pension? The advantage of a pension plan is it provides guaranteed income. Unfortunately, many companies have stopped offering pension plans. This means the burden of saving for retirement falls on you. You must figure out how to save enough to create your own pension-like income in retirement. Most pension plans have been replaced by 401(k) plans which offer a variety of investment choices. Most 401(k) plans do not offer a way to invest in something that provides guaranteed income, however, new rules have allowed for something called a qualified longevity annuity contract (QLAC) within 401(k) plans. QLACs can provide guaranteed income to you in retirement. If your company offers this option you can invest in it to create guaranteed income for your retirement. Figure out how much to contribute to your 401(k) plan if your company offers one. Contribute the maximum amount to IRA's every year. Learn about other investment options that provide future sources of guaranteed income. One other option is to figure out how to get a pension by finding an employer that offers one.